**IMPORTANT FOR IPHONE 4 USERS: DO NOT UPDATE YET**. WE’RE AWARE OF AN ISSUE CAUSING THE APP TO CRASH FOR SOME USERS. WE’RE WORKING ON A FIX THAT SHOULD BE LIVE SOON. PLEASE DO NOT UPDATE YET. Be ready for wildfire with Wildfire by the American Red Cross. Get the latest state-by-state Wildfire news, prepare your family, home and pets, let loved ones know that you are safe even if the power is out – a must have for anyone who lives in an area that is susceptible to wildfires or has loved ones that do. • Step-by-step instructions let you know what to do even before/during/after wildfires, even if no data connectivity. • Wildfire News section with state-by-state links to all fire-fighting agencies’ Twitter feeds and websites ensuring the most recent developments on current wildfires. 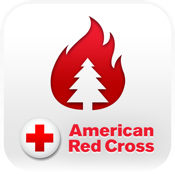 Here we have yet another invaluable app by American Red Cross, this time providing a wealth of information to improve your preparedness for wildfires, as well as offering news headlines related to wildfires and notifications of wildfires reported in your area.